The composite-flower bouquet dates from the early 20th century, mostly used for brides with an unlimited budget. 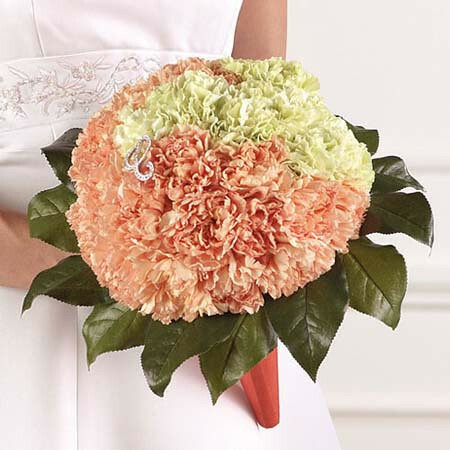 This bouquet is a variation of the round bouquet. A flower constructed of hundreds of real petals wired together to look like one enormous flower. This style is simplistic in design, but graceful and elegant. It works well in more intimate, sophisticated weddings. Although featured recently in high fashion magazines, this specialised and time-consuming technique is yet to regain its former popularity. However, a single large daisy stands alone with its striking colour, adding the finishing touches of satin or organza ribbons to bring out it natural beauty. Perfect for the bride who loves simplicity.